Last week, commodities continue to be pressured by a combination of the strengthening dollar and mounting concerns about economic growth. Coffee prices have declined dramatically over the last month, perhaps indicating that further price hikes from the coffee concepts – SBUX, DNKN, PEET, GMCR, CBOU and THI – are unlikely. Higher retail prices may remain, however, as inventory acquired at high prices is worked through. Chicken Wing prices are heading sharply higher, which is a concern for BWLD at a time when economic growth is a concern and the company is stepping up expansion into new markets. Dairy prices moved marginally higher but, on a year-over-year basis, cheese prices remain down which is a positive for CAKE, DPZ YUM and PZZA, especially considering the level cheese prices were at just a few weeks ago. Chicken wings, beef and dairy were the only items in our commodity monitor that saw price gains versus last week. The declines in our weekly monitors were far larger than the advances; as the table below shows, grains, coffee, and chicken broilers all saw significant losses in price week-over-week. In theory, this is a good thing for restaurant companies especially given the price increases that Starbucks and others have had to implement to protect margin. The reality remains, however, that much of the softness in commodities at the moment is due to concerns over the global economy. If these fears are justified, the implied softness in the sales environment would effectively offset any benefit from lower input costs. Last week, commodities continue to be pressured by a combination of the strengthening dollar and mounting concerns about economic growth. Brent crude declined almost 6% over the last week as gasoline prices also dropped week-over-week, which is generally a positive for restaurants on the margin. 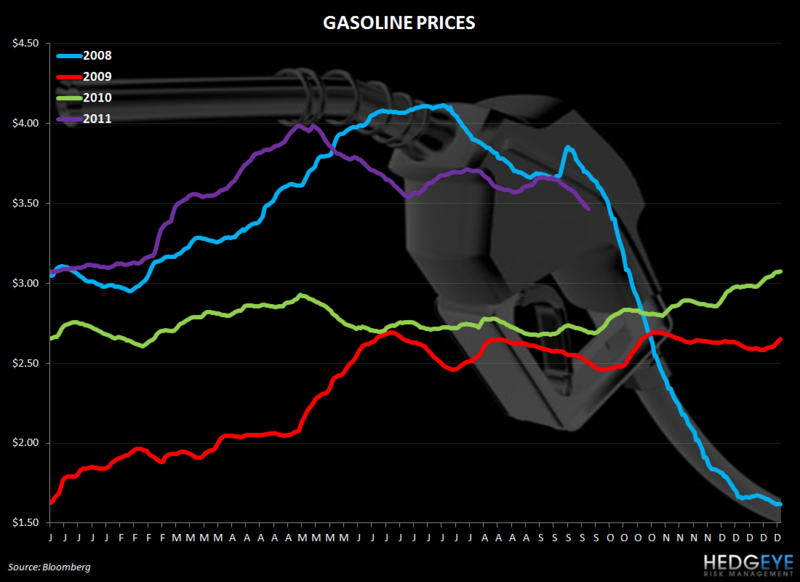 That said, the chart below shows that gasoline prices plummeted in 2008 as the recession struck. Commodities are again sinking lower here in 2011 as the European sovereign-debt crisis threatens to derail the global economy. 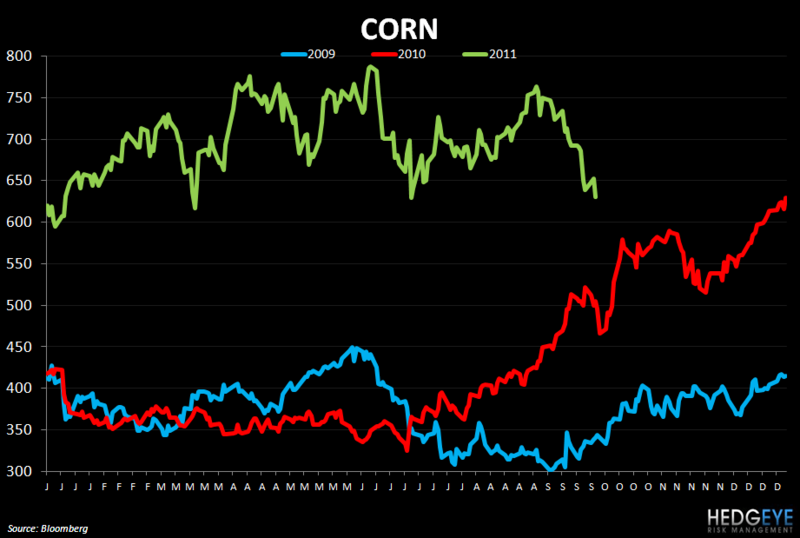 Corn dropped 8% versus last week. This is a positive data point for the restaurant industry as a whole, not only companies with direct exposure to corn costs. As corn costs come down, that offers some relief to protein producers that can take advantage of the resulting decline in feed prices. Despite smaller supply from the U.S., demand concerns are acute enough to lead prices lower. Below is a selection of comments from management teams pertaining to grain prices from recent earnings calls. HEDGEYE: Weak global demand and a stronger dollar are currently trumping the adverse impact on supply due to weather and fires in the U.S. Slowing demand may also mean lower sales for PNRA, so it remains to be seen if margins improve from this effect, even if high wheat costs come down. Coffee prices declined -7.3% as the dollar gained 1% over the same period. Kraft Foods and J.M. Smucker have already cut prices as coffee prices slump but the supply and demand dynamic point to possible continuing softness in price. According to Bloomberg, farmers from Vietman to Brazil are expected to supply a record robusta crop in the marketing year that begins next month. SBUX had bought most of its coffee needs for the year ending September 2012 earlier this year, according to management commentary on its most recent earnings call in July. This could mean that retail prices take some time to adjust as inventory is processed. Below is a selection of comments from management teams pertaining to coffee prices from recent earnings calls. 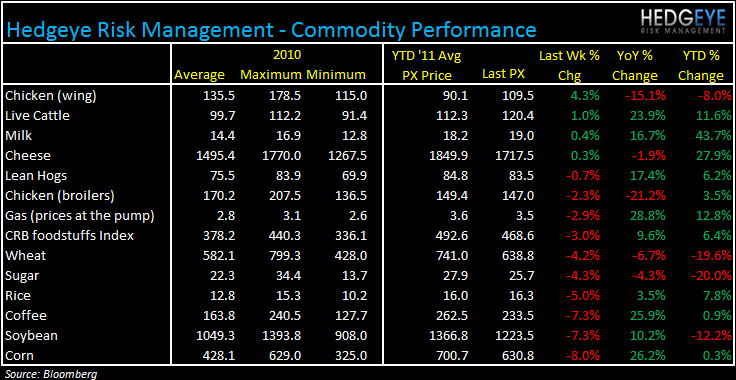 HEDGEYE: Peet’s is a company with a very competent management team that manages coffee costs extremely well. Its higher-end, loyal customer base makes the price elasticity of demand more inelastic than for other coffee concepts’ products. HEDGEYE: Starbucks is aligning itself with the right partners to gain more control of its coffee costs to provide investors with more certainty going forward and to protect its margins as global coffee demand continues to rise. HEDGEYE: GMCR hedges out 6-9 months in advance. Strength in the dollar has helped bring coffee prices lower but whether or not dollar strength will continue or not will be a significant factor in future price action in coffee. 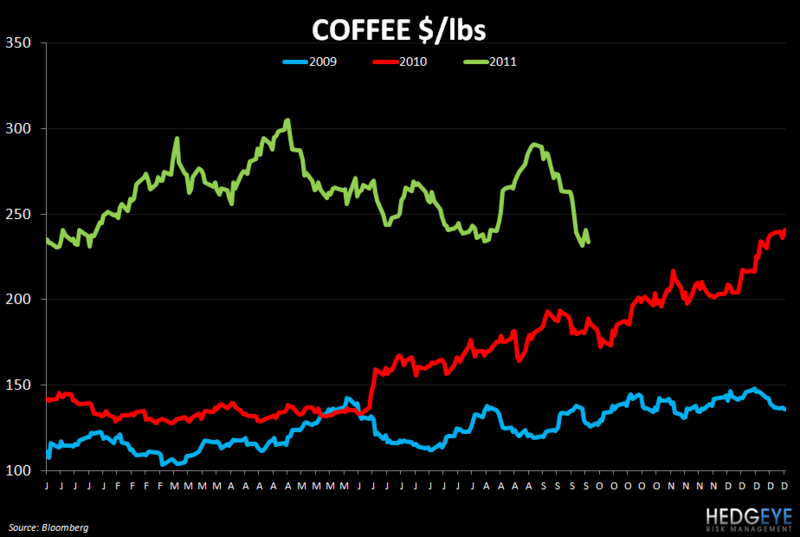 Growing demand, globally, is bullish for coffee prices over the long term. 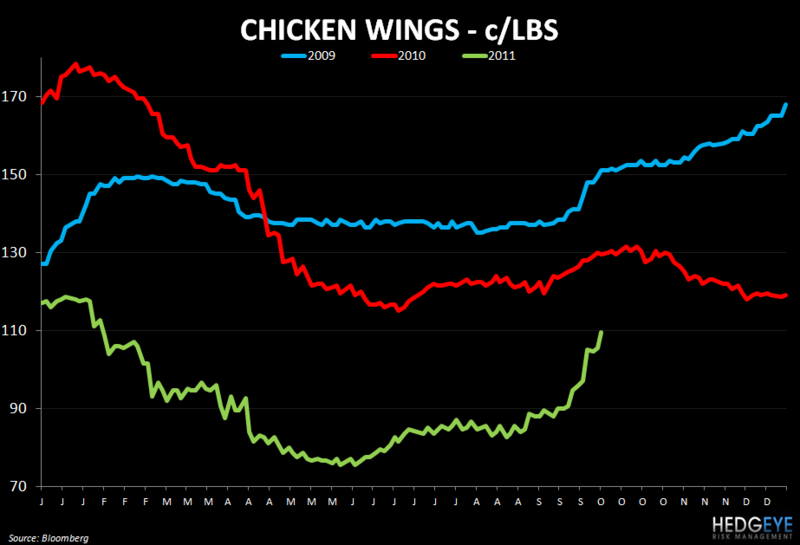 Chicken wings gained 4.3% after last week’s 7.2% gain in another down week for commodities. This is definitely a concern for BWLD at a time when the top-line environment is becoming more difficult and the company is expanding its footprint into new markets.